An interim service focusses on the elements of your car that need more regular attention and should usually happen every six months or 10,000 kms (6,000 miles). As well as keeping your car running in top condition, servicing can also help prevent costly unforseen issues that may arise when a car is left unchecked for a longer period. Generally speaking an interim service will cover your engine's air and oil filters (along with a change of oil) as well as a check on your lights and levels. Checks will also be carried out on your fan, auxiliary and timing belts, battery and connections, coolant and brake fluids, tyres and brake pads and discs. 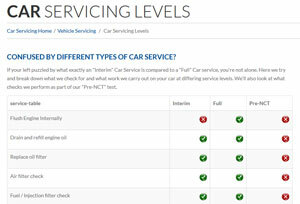 To see exactly what Coby Auto's do as part of an interim service, along with details on our Full Service and Pre-NCT checks - see our Service Levels page. The advantage of a full service history is critical when you go to sell or trade-in your car.